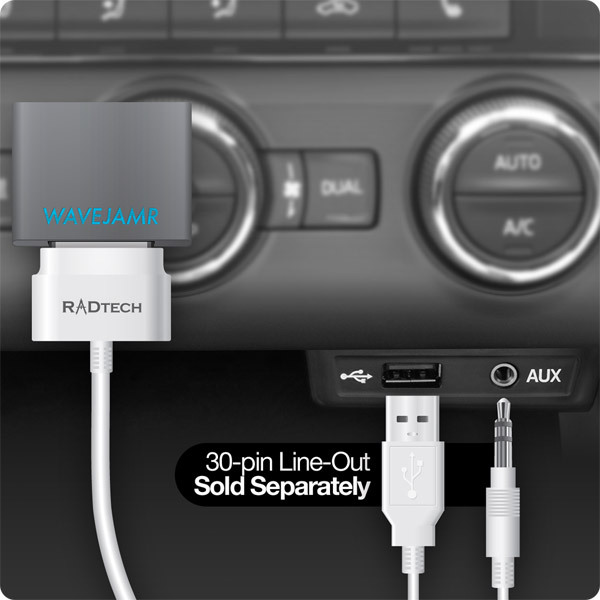 Works with 99% of speaker docks, home audio systems and vehicles right out of the box. Available accessories allow for customized installations for a variety of applications. 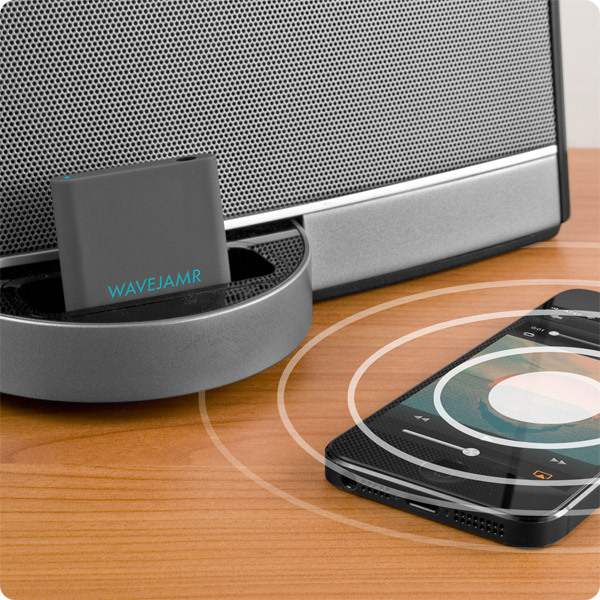 Description: WaveJamr makes practically any audio system or speaker dock wireless, while retaining true wired-quality sound reproduction - now there's absolutely no excuse not to go wireless. 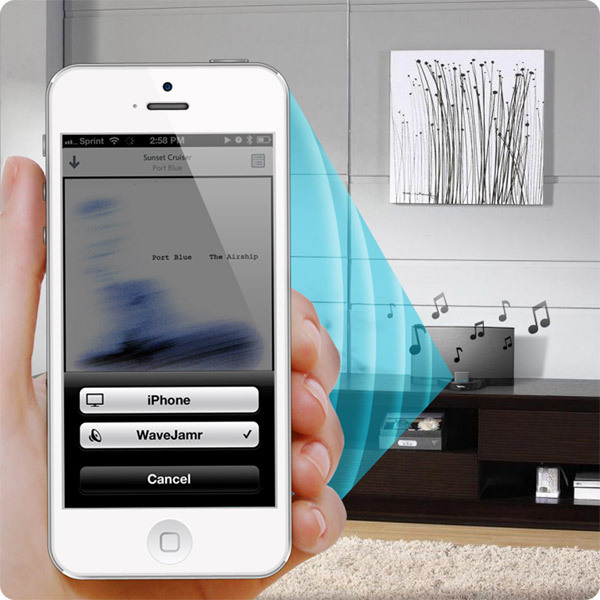 Simply connect WaveJamr to your audio system's docking or Aux-In port and enjoy your music, movie sound-track or audio books wirelessly from up to 50 feet. 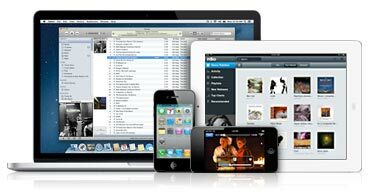 Your phone or media player now stays in your hand - ready to check email or surf the web, while your music plays on uninterrupted. Phone calls are intelligently routed to to your handset while the music fades out. 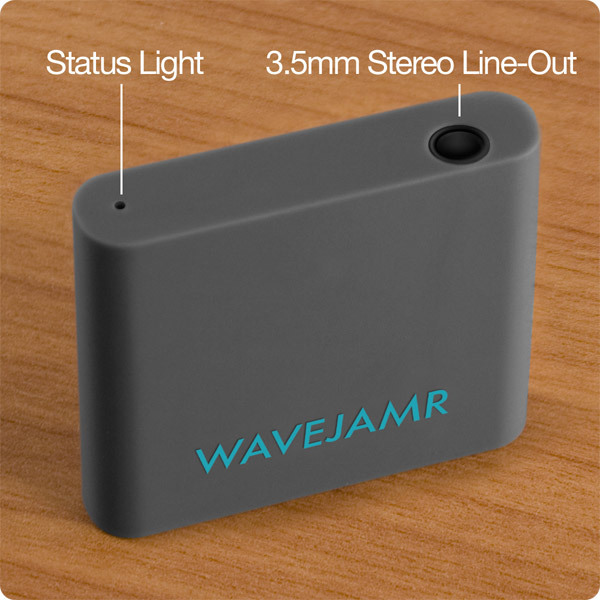 WaveJamr doesn't use batteries, or require charging, so it's incredibly small and light weight - easy to take anywhere. Delivers superb audio quality when used with any device supporting the A2DP and/or aptX protocols - this includes desktop, laptop and tablet computers, Android, BlackBerry and Windows smart phones, Apple iPad, iPhone, iPod and Bluetooth-enabled game systems. 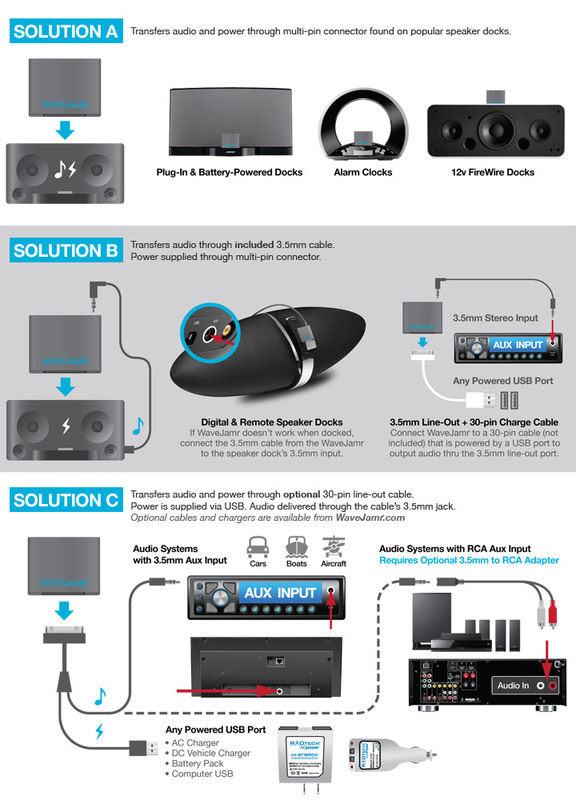 WaveJamr modernizes, future-proofs and extends the life of speaker docks, automobile and home entertainment systems while making them compatible with any future dock port configuration or docking connector. No Dock, No Problem: Don't have a multi-pin dock on your favorite speaker system or in your vehicle but still want to experience the freedom of wireless CD-quality audio? 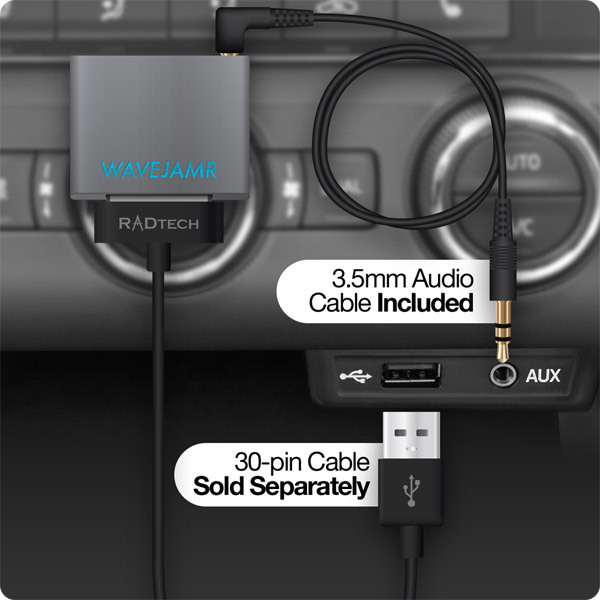 Simply connect the included stereo 3.5mm audio cable (or the optional 30-pin Line-Out cable available as and add-on above) and use WaveJamr with any 3.5mm or RCA auxiliary input. 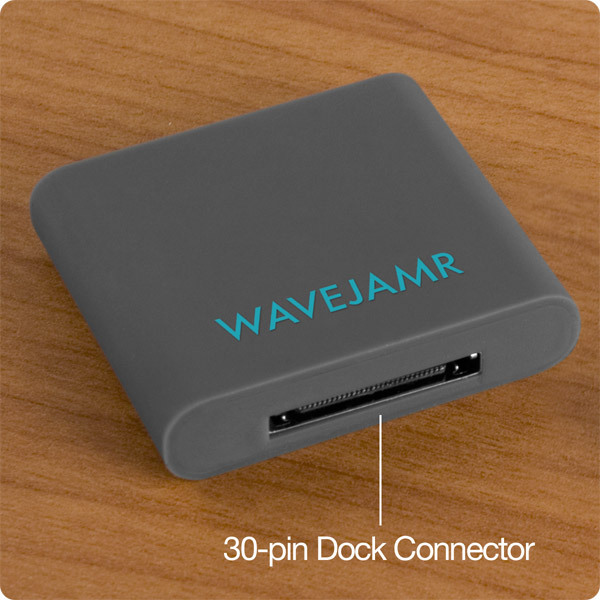 WaveJamr is powered via a standard multi-pin connector - either from a dock or common 30-pin charge cable. If using the optional 30-pin Line-Out cable, you must connect the Line-Out's male USB to a powered USB port. Although any USB power supply will work, RadTech's ACpower or AutoPower will provide clean, noise-free current to fully maximize your listening experience. 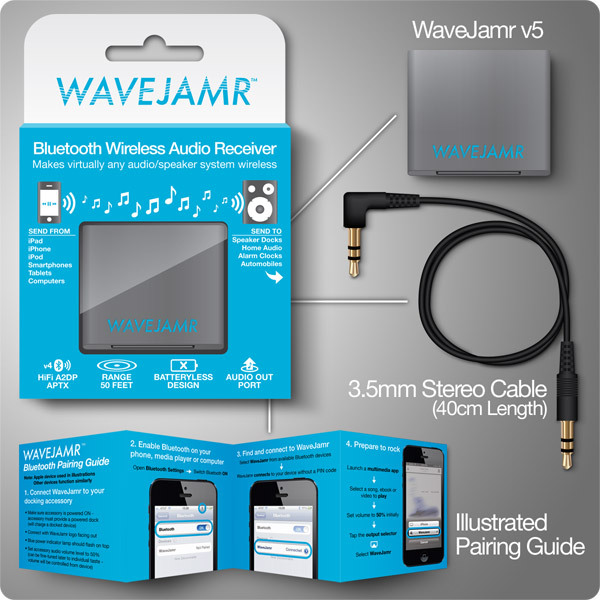 a) If your mobile device displays an "Accessory Connected" message when attached to the dock that you wish to use with WaveJamr, simply connect the included cable between WaveJamr and the accessory's Audio or Aux In port. d) Choose Headphone profile (stereo), rather than Headset (mono), if given the option, for best sonic performance. Please reference WaveJamr Instructions for operation and usage specifics. Please contact us to assist you with any issues you may encounter.